This information also gives us some sense of what the scale of the problem might be in the entire state. We can use the US Census American Communities Survey 2011 data to find out how many people have Mainecare insurance per county. 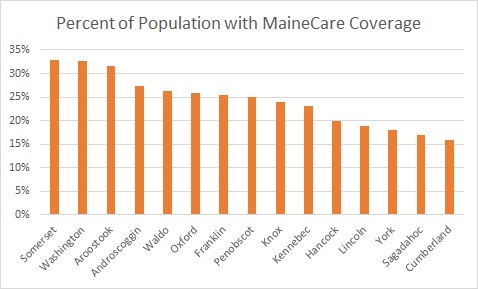 As you might suspect, the absolute number of Mainecare insurees is highest in places with the largest population. Maine’s most populous counties have the largest number of people insured by Mainecare. Looking at the percentage of county populations that use Mainecare insurance, however, provides a different perspective. Here we see the familiar two-Maines breakdown. Southern and mid-coast Maine have a lower than average percent of population using Mainecare, northern, western and downeast Maine have a higher than average percent. Then, putting the Census information together with the cited data from Tuesday’s hearing, we can see what the Mainecare rides debacle means, substantively, for access to care in the various counties. 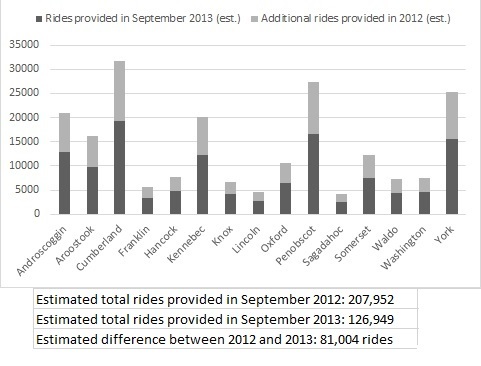 We can discover what percentage of all Aroostook Mainecare insurees got rides in September 2012 and September 2013. In 2012, 72% of Aroostook Mainecare insurees got rides from Aroostook Regional Transportation System. In 2013, 44% of them got rides. We can use these proportions to estimate what this would mean, if the rest of the state looks like Aroostook county in terms of the impact of the outsourced ride coordinators. It would mean 81,004 missed medical appointments. That is just phenomenal. About a quarter of the state uses Mainecare in order to receive health care and DHHS’s continued use of their outsourced ride coordinator is dramatically reducing their access to service. Hmmm. Why could they be tolerating such a terrible outcome? These are people who we as a state have determined are legally entitled to these services. These are people who are using medical services to meet what their (poorly reimbursed) doctors have determined are real medical requirements. On the DHHS side, that may be something on the order of 81,000 appointments in September that they somehow didn’t have to pay for. It will be very interesting to watch what happens to DHHS expenditures during the months of August 2013 and on. When we talk about balancing our state budget “on the backs of the most vulnerable,” savings realized through this method could not be described in more accurate terms.